The Woods Hole Oceanographic Institution announces with great sorrow the death of retiree Sallye Davis on December 16. She was 66. Sallye was born October 14, 1951, in Kenedy, TX. She received her B.A. in 1973 and M.S. in 1977 in Zoology from the University of Hawaii. 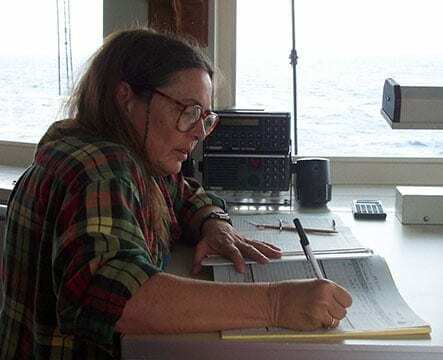 Sallye began her career at WHOI in January 1984 as a temporary mess attendant on the R/V Atlantis II. She was promoted several times and in 1992, she transferred to the R/V Knorr as third mate. From 1992 to 1998, she went back and forth between the R/V Knorr and the R/V Atlantis II as third mate and relief second mate. In 2000, she transferred to the R/V Atlantis as third mate and left WHOI in 2005.